Syrian President Bashar Assad said in an exclusive interview with the Belgrade`newspaper "Politika" that in his country know very well that Serbia went through everything goes Syria. He gave examples of media demonization, fostering religious conflict, economic sanctions, bombs and eventually grab territory. 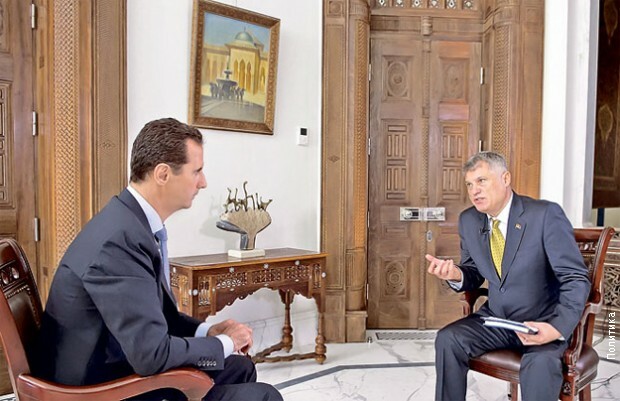 "After the courtesy to say at the beginning of the interview, President Assad reminded me of his father's long friendship with President Tito, the friendship of the nation of Syria and Yugoslavia, and now the friendship of the nation of Syria and Serbia", said the pro-Russian military analyst of" Politika" M . Lazanski in the edition of the daily newspaper from Wednesday. The article announcing the interview which will be published in full on Thursday, Lazanski said he was president of Syria personally opened the front door of the house and said: "Welcome, my friend." Lazanski, which is available for a 25-minute interview, Assad said, when asked how many in Serbia knows about what is happening in Syria, the people in Serbia supports Syria in the fight against terrorists Nusra and the Islamic State. SANA: Syrian Arab Army destroy Islamic terrorists ( Al Nusra ) in Hama. Re: USA and Israel will attack Syria ? Again ? US Senator Ron Paul: " Can`t we just leave Syria alone ? " On which TV network you looked interview with President B. Assad ? In an interview given to Britain?s Mail on Sunday published on Sunday morning, President al-Assad asserted that the alleged chemical attack in Douma was staged by the UK, France, and the US. He also said that there had been communications from different intelligence agencies in Europe, but it was stopped recently because they?re not serious. His Excellency stressed that the presence of the US and the UK in Syria is illegal and constitutes invasion as it breaches the sovereignty of Syria. President Assad affirmed that Syria is the main party who?s been fighting ISIS, and that every inch of Syrian territory will be liberated. Thanks. No TV just newspapers or internet.